Capture App, Workstation, DAW or sequencer for iPhone / iPod Touch / iPad from PreSonus. Along with the new Audiobox iSeries audio interfaces, PreSonus launches on the iPad the mobile version of its Capture recording software. Capture for iPad allows for recording audio with a maximum resolution of 24-bit / 96kHz in Apple Lossless compressed format. The app is compatible with the new Audiobox iOne and iTwo audio interfaces but you can also use the built-in microphone of your iPad. 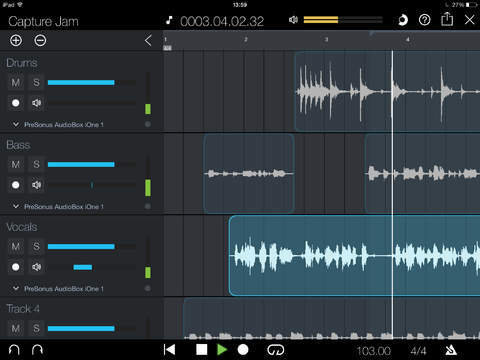 The app includes classic edit features, such as copy, cut, paste, split and duplicate, as well as level and pan controls per track. The sessions created on the Capture app can then be transferred wirelessly to the Studio One DAW on your computer. 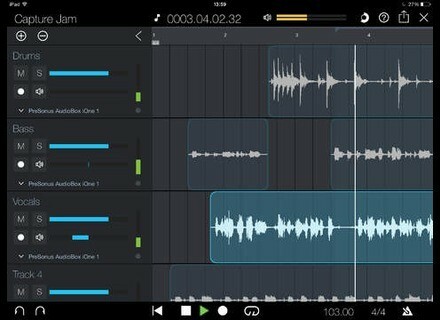 The Capture App is available in two editions: Capture Duo is free and offers a 2-track recorder, while Capture for iPad (8.99€ / $9.99) allows for sessions of up to 32 tracks. The apps are available immediately at the AppStore. [NAMM] 2 new PreSonus AudioBox audio interfaces PreSonus introduces at Summer NAMM 2014 two new Audiobox audio interfaces that are class compliant for use with Mac, PC and iPad. Help Cancer Research UK with De la Mancha De la Mancha has been inviting you to donate to Cancer Research UK for several months, and he now wants to reach £1000. AudioThing releases Valve Exciter The new AudioThing plug-in is an harmonic exciter in VST and AU formats for Mac OS X and Windows 32-bit.